House flies aren’t particularly picky where it comes to choosing locations to lay their eggs. Rotting garbage, manure, grass clippings or other decaying organic material are perfect spots as far as the fly is concerned. Flies spend their short lives focused on reproducing, and females can produce as many as 1,000 eggs during their lives. 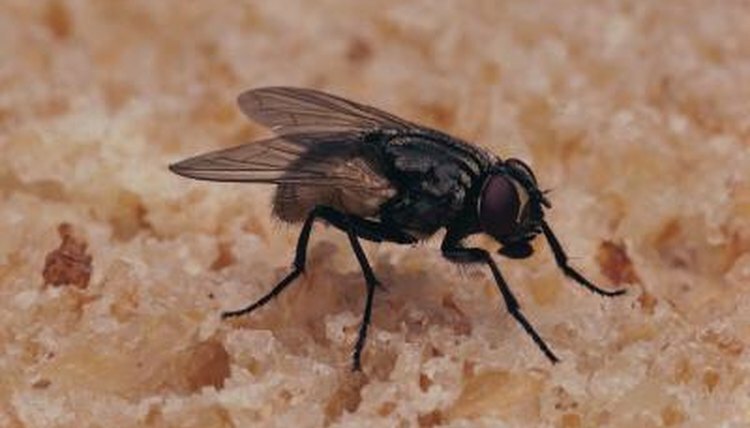 The moisture in manure and garbage is what attracts female flies when it’s time to lay eggs. If the eggs dry out, they won’t hatch. A female can lay up to 150 white eggs at one time, and she usually lays eggs in groups. Each egg looks like a tiny grain of rice and is about 1/25th of an inch long. Temperature influences hatching time. The Penn State College of Agricultural Sciences reports that eggs hatch in 7 1/2 hours when it’s 99 degrees Fahrenheit, and in two days when it’s only 59 degrees. You’ve probably seen wriggling white maggots in a garbage can on a hot day. The maggots are the larval form of the fly and look like white worms. Maggots are born on their food source and then feed on the garbage, manure or other material. Maggots molt and change appearance three times before they enter pupal stage of development. They also develop faster if it’s warmer and can reach maturity as soon as four days in very warm conditions. If it’s cool outside, it can take up to 30 days until a maggot reaches maturity. Once a maggot reaches maturity, it crawls off in search of a drier, cooler place in which to undergo the next life cycle stage. The maggot’s skin hardens into a brown pupal case, which protects it from the weather and predators. It will spend anywhere from two days to one month in the case, depending on the temperature. As the pupa changes into a fly, it grows wings and legs. When it’s fully grown, it breaks out of the pupal case and flies away. The adult house fly starts looking for love as soon as one day after it leaves its pupal case behind. First it finds a food source, one that contains sugar, and then it finds a mate. The female house fly lays her eggs approximately 4 to 20 days after she mates with the male. House flies aren’t picky eaters and will feed on anything, including rotting garbage, sewage, oozing wounds and spoiled meat. When they land on a person, they tend to vomit or defecate, potentially exposing the unlucky host to germs they picked up while dining. The life of a house fly might be over in as little as three weeks, but if the weather’s cool, it might live as long as two months.